WHY CHOOSE OUR MACARON MAKING SET? Can be placed directly into the oven , microwave and refrigerator , suitable for temperatures between -30C and 260C. Food-safe silicone, environmental protection material, non-toxic, odour and taste neutral. This silicone baking mat can also be used to make ice pudding, cookie , cake, mousse jelly, chocolate etc. The decorating pen is easy to use and make perfectly macarons and other desserts. The baking mat is also easy to clean and can be reused for a very long time. We are sure you will love this macaron making set, but if you aren't happy with it, at any time, simply let us know and we'll promptly send you a full refund. HIGH TEMPERATURE RESISTANCE- Can be placed directly into the oven , microwave and refrigerator , suitable for temperatures between -30C and 260C. SAFE & HIGH QUALITY MATERIAL - Food-safe silicone, environmental protection material, non-toxic, odour and taste neutral. MULTIPURPOSE - This silicone baking mat can also be used to make ice pudding, cookie , cake, mousse jelly, chocolate etc. EASY TO USE & EASY TO CLEAN - The decorating pen is easy to use and make perfectly macarons and other desserts. The baking mat is also easy to clean and can be reused for a very long time. 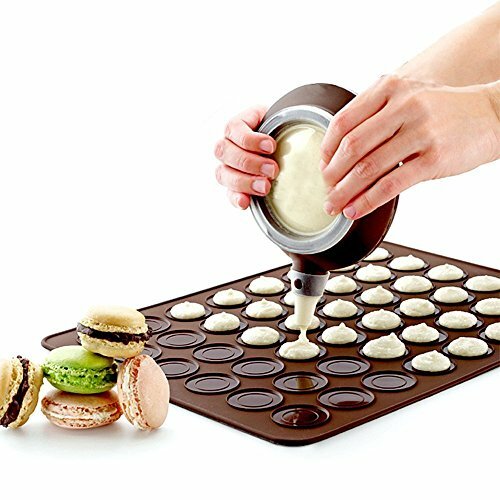 100% LIFETIME SATISFACTION WARRANTY - We are sure you will love this macaron making set, but if you aren't happy with it, at any time, simply let us know and we'll promptly send you a full refund. If you have any questions about this product by QiyuanLS, contact us by completing and submitting the form below. If you are looking for a specif part number, please include it with your message.